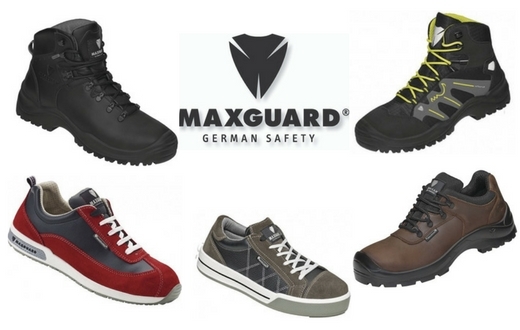 Munster Fire & Safety is the first Irish stockist of Maxguard German Footwear. German Safety is the claim of Maxguard - and that means quality workmanship. .
All products are developed by Maxguard or with external, award-winning design studios. The selection of materials used are according to very strict quality guidelines. Maxguard shoes and boots are manufactured in modern production sites with experienced shoe technicians. The latest technological equipment is used, for example in the field of automatic capping. The production facilities are ISO 9001 certified and fair working conditions prevail. MAXGUARD is a trendsetter in design, functionality and comfort. Therefore they only work with the best designers, shoe technicians and production sites. All MAXGUARD safety footwear meets the required safety regulations; guaranteed. For them minimum requirements only exists to outdo them. See some of the range available in our online shop or contact us to request a catalogue or a site visit.